Looking "where to sell my Austin Healey 3000?" Ask the Chicago Car Club! Are you wondering "where to sell my Austin Healey 3000 ?" The Chicago Car Club is interested in classic cars of all makes and models, especially a Austin Healey 3000. 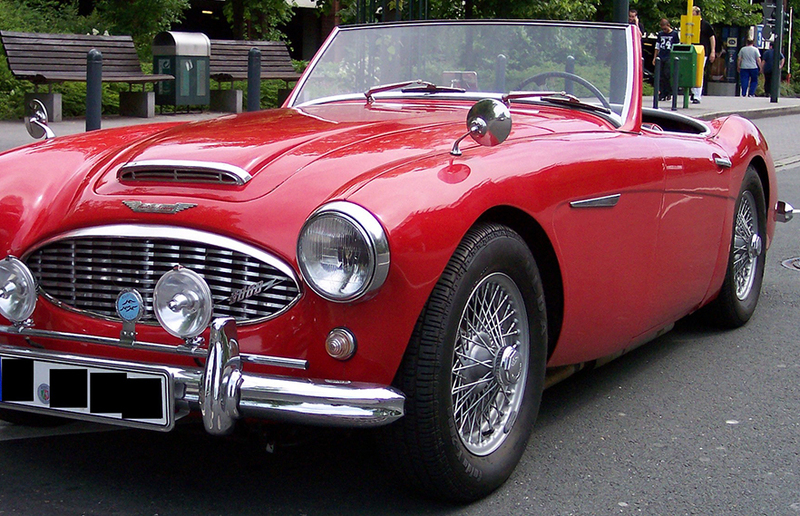 We make the process of selling your Austin Healey 3000 quick and painless. In just a matter of hours we will have your classic valued and, if you do so choose, turned into money in your pocket. All it takes is a phone call or electronic inquiry to get the ball rolling. The Austin-Healey 3000 was a series of British cars made between the years of 1959 and 1967. All were made with convertible style bodies. The 3000 model is known as the “Big Healey.” The body was made by Jensen Motors and the cars were assembled at the Austin-Healey Abingdon works in the county town of Berkshire. There were 3 editions of the 3000, the first of which, the Mark I, was produced between March 1959 to March 1961 and came in two forms, the BN7 Mark I (2-seater) and the BT7 Mark I (2+2 version). It came with a 2912 cc I6 engine with twin SU carburetors. It had attractive features like wire wheels, overdrive gearbox, adjustable steering column, detachable hard top, and two-tone paint available as options. The Mark II debuted in March 1961 as the BN7 Mark II (2-seat) and BT7 Mark II (2+2.) It had slight cosmetic design changes, but the main difference was improved performance from the three SU HS4 carburetors and an improved camshaft. The British magazine, Motor, tested it and found a top speed of 112.9 mph (181.7 km/h) and could accelerate from 0–60 mph (97 km/h) in 10.9 seconds. The Mark III was built between 1963 and 1967. It was the last of the Austin-Healey cars produced. BJ8, the 2+2 Mark III was the most powerful and luxurious of the Big Healeys. A new carburetor and exhaust gave it more power than previous iterations. 2,825 BN7, and 10,825 BT7 were made, for a total of 13,650 cars. List price when new was £1326 including taxes.